In a style honoring Catalan architect Antoni Gaudí, Apple has made a Trencadís mosaic with a brilliant multi-colored Apple logo and a number of other fanciful designs that appear to be inspired by iOS app icons. 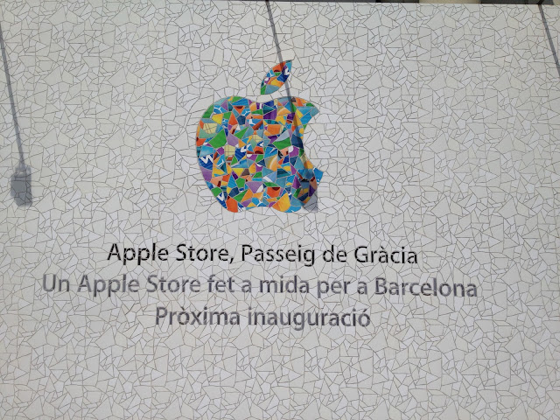 Apple will open in a few days the new Apple Store in downtown Barcelona. Will be the second biggest one in Europe and a surprising logo has been discovered today featuring an Antoni Gaudí Style -the iconic Barcelona architect, master of the Sagrada Familia. The new store is located on Passeig de Gràcia in Barcelona, near Casa Batlló and Casa Milà, two famous buildings by the architect. iPordelante has a number of other photos from the store. This is an actual tile mosaic, not printed! Wow, clicking through is worth it, some awesome stuff. And if you're wondering, the sign is in Catalan, not Spanish (Castellano). 75% of the workforce and 60% of young people are in work, that's how. This is awesome. It would be even better if Apple did more localization in the future. How about one with palm trees and a beach for us here in California? Reminds me of the orange coverings for the Amsterdam store. Without getting too much into it, the Catalan are an ethnic group in northern Spain -- some support Catalan independence from Spain and there is a distinct identity different from that of the Spanish. It's not unlike the Quebeçois versus the Canadians. They have a different language and would consider a sign by Apple in Spanish to be insulting. Apple has long had signs in its Barcelona stores in Catalan. Wow, great work. It looks great against the building. Apple really cares about their stores and the surrounding area. The all black walls look really ugly now. That's brilliant! It's great to see Apple pay homage to Gaudi and as Trauma1 says, the orange on the Amsterdam store was a tribute to The Netherlands. It's great that they see each store and country individually. They seem to be doing OK in the good 'ol USA. Yes, but there are better ways to honor artists, for example paying them. So why doesn't Apple use a local, well-know Barcelona artist to design their logo? Or why don't they honor Gaudi by making a donation to restore one of his works? I really do see this stuff as just a cheap rip off. Like putting a cover band to play a popular song in a tv ad. I guess they collect VAT and pay it to the city. That's a start. But, yea: The "Sagrada Familia" still needs a lot of donations to be built according to Gaudi's plans.